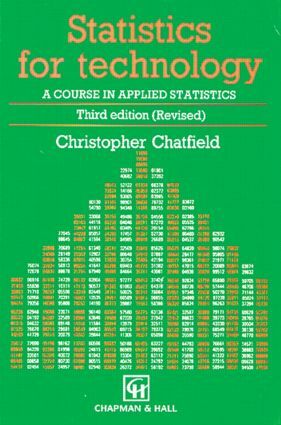 One of the most popular introductory texts in its field, Statistics for Technology: A Course in Applied Studies presents the range of statistical methods commonly used in science, social science, and engineering.The mathematics are simple and straightforward; statistical concepts are explained carefully; and real-life (rather than contrived) examples are used throughout the chapters.Divided into three parts, the Introduction describes some simple methods of summarizing data. Theory examines the basic concepts and theory of statistics. Applications covers the planning and procedures of experiments, quality control, and life testing.Revised throughout, this Third Edition places a higher priority on the role of computers in analysis, and many new references have been incorporated. A new appendix describes general methods of tackling statistical problems, including guidance on literature searching and report writing.